The thing that makes a normal guitar a short scale guitar is the smaller distance between bridge and nut. It’s only a matter of an inch or two, but the difference is massive in terms of playability. If you’re an adult with smaller hands, or you’re looking for one for a child, then you should consider one of these. 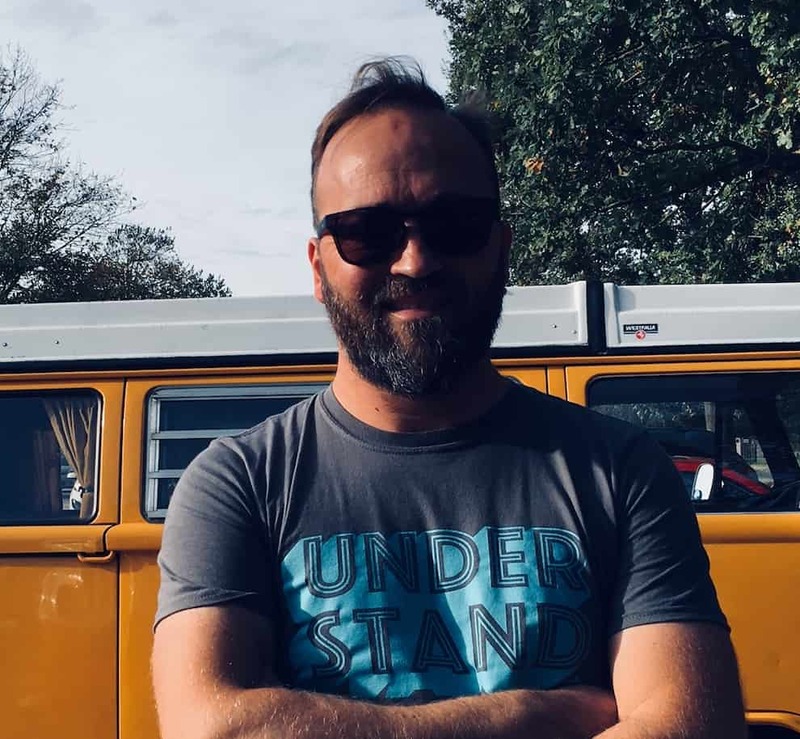 In this article, we are going to look at all the reasons why you might want to get one. As you’ll see, the benefits aren’t just for people with smaller sized hands. What is a Short Scale Guitar? As briefly mentioned in the introduction, scale length is the distance between bridge and nut (from 22 inches to 24 ¾ inches). The typical scale length of a guitar is 25.5 inches. Fender uses the standard 25.5-inch length on its Stratocaster and Telecaster models as you can see in the picture below. However, they have produced a line of shorter scale six-strings – namely the Jaguar, Mustang, and Duo-Sonic – which are all 24 inches. Gibson’s standard scale length is a relatively small 24 ¾ inch found on the Les Paul, SG, and Melody Maker, among others. Gibson’s Byrdland model goes as low as 23.5 inches, making it one of the smallest guitars in their range. Does this mean there are fewer frets? No, not at all. However, it does mean there is less distance between the frets. For small-handed players, this is what makes one a lot easier to play. Along with body size and choice of wood, string tension is an essential factor for creating good sound. The shorter length between nut and bridge requires less pressure to keep in tune. This lower tension also means that less force is needed to fret and pick the strings, so it’s easier on the fingers for newer and younger players. Surprisingly, this also affects sound – the lesser string tension required actually gives you a warmer tone. Low-tension strings better emphasize the lower, middle frequencies, which is especially useful for beginners who will make thousands of mistakes while learning. You may find that the diminished string tension contributes to a slight buzzing sound if your action is set too low. This is fixable by adjusting the action. In many cases, these products are purpose-built for the beginner, student or child. This means that they are often very affordable. The fact that they require fewer materials to make reduces the overall cost. It is worth noting that, however, there are many premium options that are just as expensive as full-sized models. For the traveling musician, weight is a big consideration. Being smaller and lighter than a standard guitar, transportation is more straightforward. The smaller size also allows for easier storage which is excellent for homes short on space. Consider the wood type of the neck as different types are heavier or lighter. Maple can often be neck heavy, therefore not the best for children. Rosewood is also heavy and expensive but a great hard-wearing wood. Basswood is exceptionally light and can also be the cheaper option. As for the fingerboard, rosewood is good too for its warm, rich tones – the one downside is it often comes from Brazilian rainforests. Consider pau ferro, a sustainably sourced wood that captures the warmth of rosewood without destroying the planet. You should also focus on the neck profile – it doesn’t affect the sound but can change the way you play. The C shaped neck is the most common profile. Its comfortable oval shape is suited to most styles of playing. For beginners buying a short scale, I’d opt for a C-Shaped neck too. Neck width is also important – ensure you have a diameter which fits comfortably in your hand. A traditional axe will have a neck width of roughly 1.7 inches whereas the usual short scale will usually come to around 1.65”. So, now you know what you’re looking for, it’s time to look at a few. The Fender Mustang is much more than simply ‘a short scale guitar’. It’s an underground indie classic and, along with the Duo Sonic below, is by far the most prestigious on this list. It has a reputation as a garage rock icon (used by My Bloody Valentine, Nirvana, and Sonic Youth) that oozes non-conformity with its unique aesthetics, fat Fender tone, and tiny size. Indie rockers Sonic Youth even have a whole section of their website dedicated to their gear. You need to have some serious cash to get hold of a vintage model, but if you’re happy to settle for second best you can grab one of these MIM (made in Mexico) Mustangs which will sound almost as good. In terms of spec, the Mustang has a 24” scale length, small fingerboard radius (9.5 inches) with MP90 single coil pickups that will give you the signature snarly mid-range and punchy low end. If you want to match it with a similarly small amp, pair it with a tube amp like a Fender Champ 20 or Vox AC10 amp. While all of the items on the list are in theory suited to children thanks to their miniature size, the Mustang is primarily an adult (or at the very least teen’s) item. If your 8-year-old child is really into his Nirvana, then he’ll love you forever if you get him one of these. But for the relatively clueless kid (I have two kids under ten years old and know all about that), a Mustang is total overkill. It’s like giving your kid a vintage VW Beetle as a first car. Shorter frets and relatively low action make it super easy to play. Super lightweight and short makes it easy enough to transport. 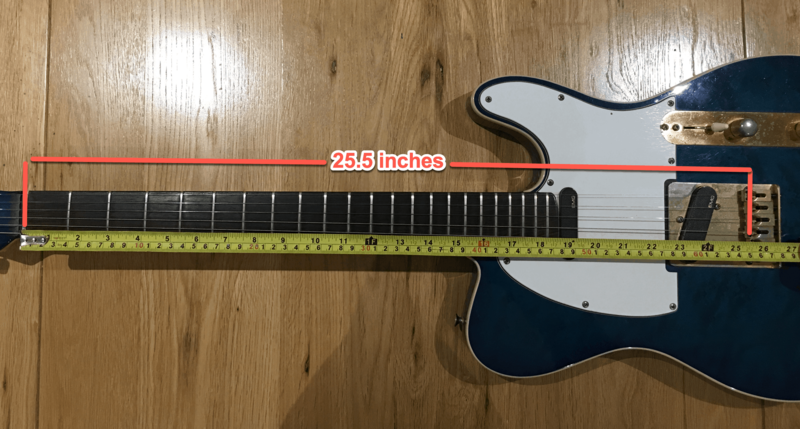 Fretboard radius measures at the standard 9.5 inch. No tremolo bar, which may frustrate some players wishing to raise or lower the chord. Pricier than most on this list, but you’re getting a classic, so it’s worth it. Another MIM model from Fender, the Duo-Sonic is another classic which found fame through rock-god Jimi Hendrix. Its uniqueness comes from its split pickups – a single-coil neck pickup and humbucker bridge pickup with coil-split capability. Like the Mustang above, it keeps the 9.5-inch radius fingerboard but changes things up with a pau ferro fingerboard as opposed to rosewood. Pau ferro boards sit between ebony and rosewood tonally, keeping the warmth of rosewood with a slightly snappier tone. Despite these differences, you may be thinking the Duo Sonic looks very similar to the Mustang. You’d be right, it does. There is one subtle, but big, difference. The Duo-Sonic has a slight curve towards the bottom of the body, making its middle curve more forward than the Mustang’s. On the Duo-Sonic, the apex (or high point) of the curve is between the pickups. On the Mustang, the top is directly under the bridge pickup. What difference does this make? 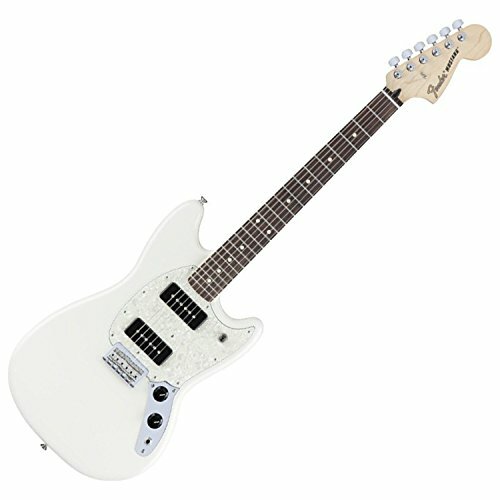 As well as a slight difference in tone, the Mustang is more comfortable to play sat down. Split pickups give you enhanced upper harmonics with an articulate midrange. Pau Ferro fingerboard looks and feels great. a 9.5” radius allows for easy playability. Like the Mustang, but not as cheap as some items on this list. Mustang is more comfortable to play sat down. Modeled on the king of electric blues guitars (the Stratocaster), this mini guitar from Oscar Schmidt is worth a look at. Its a ¾ sized double cutaway model with a five-way pickup selector and a standard fulcrum tremolo bridge – giving this small six-string a few added extras. A maple body, 3/4 size and 24” scale length makes the Oscar Schmidt 6 superb for any touring musicians as it’s durable and portable. This product is exceptionally light too; weighing in at only 5 pounds. This makes it just the ticket for children with smaller hands too. Easily the smallest on the list, but still packs a punch. Built to last. The company are reputable and have created a quality short scale. Too lightweight? May feel a bit toy-like for experienced players. For a ¾ size, it may be difficult to utilize the 24 frets. They are placed together closely which may be great for kids, but not so great for anyone with bigger fingers. The MiKro is the first small sized axe produced by Ibanez, making it the ideal instrument for a child. Despite its small size, it can still produce the sound quality you would expect from its larger siblings. This is especially true when paired up with a decent amp. The scale length is particularly small at only 22.2 inches. The maple fingerboard and 24 medium frets make it perfect for shredding. Its dual pickups make it versatile enough to suit multiple playing styles. The radius of the neck is quite large, measuring at 12 inches. Some children may struggle to get to grips with it initially, but with practice, there shouldn’t be an issue. The lightness should offset this: weighing only 9 pounds, it’s one of the lighter instruments out there. The unbelievable short scale length allows this instrument to be picked up and carried anywhere. Perfect for the traveling musician or those lacking space at home. Low tension on the strings makes for easier playing, ideal for beginners wishing to play around and practice for extended periods. Available in left and right-handed setups. At 12 inches the radius of the neck is large. The pickups are excellent for the price, but to get the best sound you should think about upgrading. The Peavey Captain America is perfect for any comic book fan, child or adult alike. They’ve built the Captain America for the younger players – it’s light, comfortable to hold and easy to grip. The controls are reasonably intuitive, perfect for beginners. You control the volume by a master switch and three-way toggle switch. There is a coil-split activation which gives you a few more tonal options. Scale length is 22.5”, making it for kids. The rosewood fretboard makes for smooth playability and rich sounds. The decorative design is fantastic for children and adults with nostalgia for comic books. Basswood is one of the cheaper wood options. It sounds alright, but isn’t as long lasting as maple or mahogany. The sound quality may not be as crisp as some of the more expensive products on the list. This is designed for kids. Experienced players may find the instrument lacking in power. This is the smaller version of the popular Squier Bullet and is great for any newbie who needs to grasp the basics of guitar. The C-shaped maple neck and the 20-fret fingerboard is easy to grip which adds to the comfort and playability. 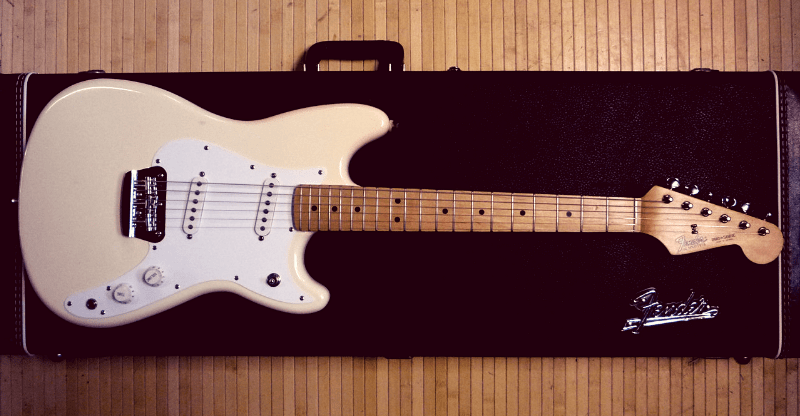 It has three single-coil Stratocaster pickups and five-way switching, making it easy to learn and use for newer musicians. Setting up is simple by the use of a hardtail bridge, instead of the floating tremolo usually found on Stratocasters. The hardtail makes maintenance (from restringing to tweaking intonation) simpler as the build is lighter without much tonal difference. Affordable price for a mini-Strat considering this is a smaller version of the ever-popular Bullet. The maple build and hardtail bridge stays in tune well, even after hard usage. The low weight, comfortable neck, and close frets make this ideal for the younger players. The body is made from basswood, meaning this may not be as long lasting as others on the list. Extraordinarily light and therefore could be an issue for older kids or adults who see this too much as a ‘toy’ rather than an instrument. 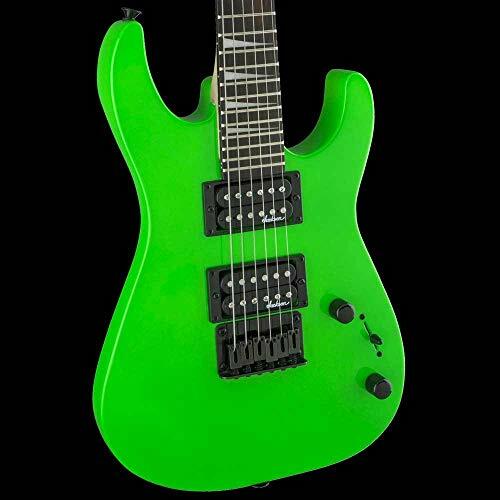 In an eye-catching neon green finish, the Dinky Minion (nothing to do with the Minion franchise) is ideal for the younger heavy metal star. The 22.5” scale maple neck is small and comfortable enough for most kids to play sitting or standing. It has two humbucker pickups, a single master control switch, and a master tone control. This gives children the freedom to mess around while keeping the actual process simple to master. Bolt on maple neck can withstand the vibrations produced by heavy usage, especially if used by heavy metal rocking. The heavier weight makes the Dinky feel more like the real deal than a toy. SA rosewood fingerboard creates a polished look and feel, giving the Dinky its rich, warm tone. The fingerboard radius is 12”, which can be tricky to hold for much younger players. However, older children and adults will have no issue getting used to the size. Top of the list has to be the Fender Mustang. With its MP90 single coil pickups, you get that signature snarly mid-range and punchy low end. Its low action and contoured body make it super comfy to play too. Plus it’s an underground classic – so if you’re into indie music, it’s the obvious choice. 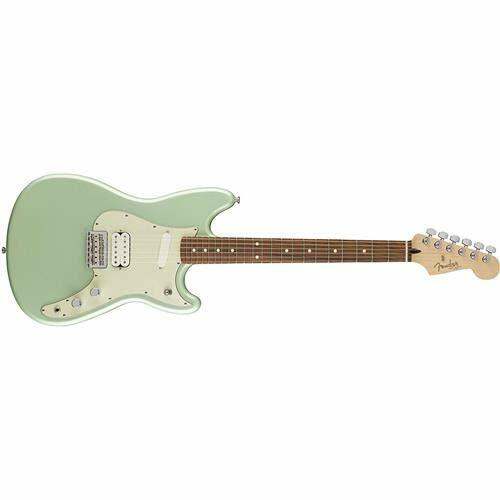 The Fender Duo Sonic comes a close second and adds a nice twist with its split pickups and coil-split capability. If you’re looking for a first electric guitar for a young child, then I’d look at the Jackson JS Dinky Minion or Peavey Captain America 3/4 Rockmaster – if your kid is a Marvel fan, then the Captain America is a no-brainer too. 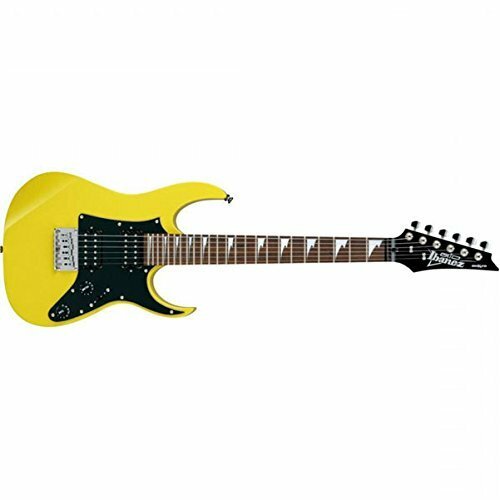 If you’re an adult looking for something super short scale (22.2 inches), I’d check out the Ibanez MiKro. It’s super small size makes it an excellent travel guitar too. I hope you’ve got a firm grasp of why a short scale guitar is worth buying and a pretty good idea of which one is right for you. Good luck with your purchase and thanks for dropping by.